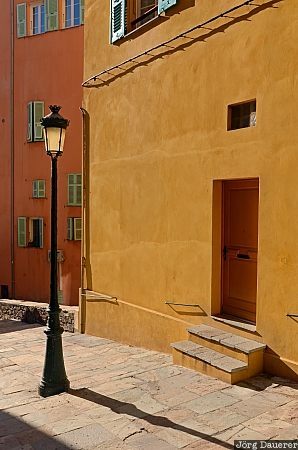 A small alley with a street lamp and its shadow, a door and colorful walls in downtown Bastia. Bastia is in the south of Cap Corse in the north of the mediterranean island Corsica, France. This photo was taken in the morning of a sunny day in September of 2011. This photo is part of the exhibition The color Yellow (June 2013). This photo was taken with a digital camera.